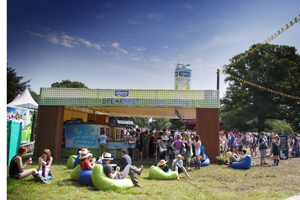 Alpro's giant cereal bowl is hitting the road again as experiential agency ID takes the breakfast brand's 'Enjoy Plant Power' campaign to train stations and festivals this year. ID was briefed to raise awareness of Alpro’s new plant-based cereal among women aged over 25. The two-pronged approach will target consumers during their daily commute at stations and in their leisure time at summer festivals. In March and September, breakfasts will be served by Alpro brand ambassadors at commuter stations on central concourse stands. Breakfast bags and dessert boxes will also be handed to passing commuters by teams in outdoor street locations in cities. ‘Enjoy Plant Power’ will also hit the road to visit UK festivals over the summer, serving breakfast from stands. it will invite festival-goers to pose for aerial photos in a giant cereal bowl, similar to the giant bowl which toured festivals last summer for Alpro Soya. Paul Ephremsen, chief executive of ID said: "We’re thrilled to be working with Alpro again as part of an ongoing relationship that now spans three years. We’re confident that this campaign will be successful in attracting new females to the Alpro brand in both their everyday and leisure time." For more in-depth industry features, showcases and interviews with the world leading brands don't miss the next issue of Event magazine by subscribing here.